Our very long, and very hot summer is over, and we are now well into 'bunka no aki'. I've never been quite sure just why the Japanese language should characterize autumn as being the 'culture' season, but it certainly seems true that the demands on my time, and the activities I find competing for my attention, dramatically increase at this time of year. The period from March through August is generally quiet for me. I sit carving and carving, usually working on the prints without much interference or distraction. But from September, right up until exhibition time in January/February, the pace gradually changes. There are speeches to make, demonstrations to give, any number of publicity events and interviews, extra prints to make (one for the local Culture Day workshops, and then the New Year's card ...), and of course, the inescapable preparations for the upcoming exhibitions. Sometimes in the spring I make myself a promise, "This year, during the quiet half of the year, I'll work more seriously, and get ahead in the print schedule, so that when autumn comes there won't be so much pressure!" But this year, as you know, I failed miserably in that promise. Your prints have been arriving later and later every month, and I'm now nearly a month behind. I think though, that there is still time to get the set of ten finished before the exhibition, but only if I put away this word processor, and get back to my carving! Although I have described myself as being quite 'single-minded' in my infatuation with the flute, I was not 'narrow-minded' about it. For me, to be interested in something, means to try and learn about everything even remotely related to it. My internal 'switch' seems to only have two positions - 0% interest ... or 100% interest. I was interested in flute playing? Very well, then I would also ... learn how to fix flutes, arrange music for our school band, conduct the ensemble, organize the band's music library, study about the composers ... In a pattern with which readers of this newsletter are quite familiar, I cast my net very widely, more widely than was perhaps wise. But isn't this the best way to be involved with something - to dive in and completely immerse oneself in that 'world'? 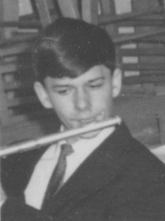 As we will see later, as I matured, I discovered that the dream of being a symphonic flute player was not well-suited to either my abilities nor my character, but at the time, that vision filled my life with challenge and meaning. One problem for me during these years was the actual flute I was using. The instrument supplied by the school was a very cheap model indeed, and I soon became very frustrated with it. My father had his own flute, which I was allowed to use, but it wasn't much better. Unlike many people in this society here, who feel like they must arm themselves with top-level equipment even when they are just starting out on some new venture, his attitude was more pragmatic. "Oh, it'll do ..." Making music was more important to him than collecting tools, or keeping up appearances. But my horrible instrument was driving me crazy. My parents recognized my enthusiasm and need however, and one day, even though they must have been sorely pressed for money, purchased for me a second-hand instrument from one of the players in the local symphony orchestra. I think it cost $125, an amount that now seems laughably small, but which at the time must have been a significant investment for them. It was actually only a student model flute, but it was still far better than the school instrument, and it was gold-plated, while all the other people around me were using silver-plated instruments. I was to be different! That flute became my inseparable companion, and was to remain so for many years. I built a special case for it using beautiful wood veneers and velvet, and I suppose that while other 'normal' students around me were infatuated with their girlfriends, for me there was only this flute ... this beautiful flute. "Let's make beautiful music together ..."
A couple of years ago in this 'Hyaku-nin Issho' newsletter (in Issue #9), I talked about the two different editions of the Shunsho book that were published back in the Edo era, one with the poems in Shunsho's delicate writing, and another one by a different calligrapher. And now, I'd like to introduce a third edition, with the poems drawn by yet another calligrapher ... one of my collectors, Mr. Fusahiko Tanaka. A while ago, Tanaka-san wanted to know if it was possible for me to supply prints without the calligraphy - just an open space surrounding the figure of the poet. I thought it might be a bit too difficult to make a print like this, as the poem is of course carved onto the same woodblock as the figure, but I was intrigued by his request, and agreed to try it. It turned out to be possible, so these days I am sending him 'blank' prints. 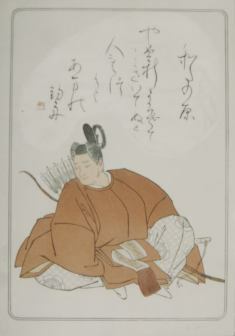 He then fills in the poems himself, and month by month, a quite unique set of 'Hyaku-nin Isshu' is being born. After reading about this idea you may expect to then hear that Tanaka-san is a calligraphy teacher, but actually, his job is quite different. He is a 'yaoya-san', a greengrocer. 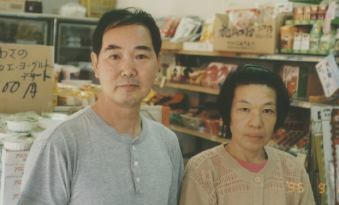 He and his wife Fumie provide fruit and vegetables to the people of their neighbourhood in Inagi City here in Tokyo. I have long since ceased to be surprised by the types of people who are interested in my printmaking work, having learned that an interest in things like poetry, hanga, and calligraphy is not exclusive to some 'elite' group, but is found in people from all walks of life. I find it hard to imagine a Canadian greengrocer having any interest in things like calligraphy, but step into the room behind Tanaka-san's shop, and he can pull out folder after folder of his work to show you - poems and illustrations. During the day ... vegetables, during the evening ... the 'fude'. Tanaka-san and his family have been solid supporters of my project for years now: helping out at exhibition times, taking my girls to an amusement park, and giving me plenty of feedback on the progress of my work. And due to his interest in calligraphy, this feedback comes in a particularly interesting form - the hand-written letters that he sends. Receiving one of these elegantly drawn missives is like being presented with some kind of wonderful old scroll. Many years ago, when I first started to get such letters (and not just from Tanaka-san), I wasn't able to read much of them by myself, but my ability to decipher them has gradually grown, and I can now usually understand most of their content without resorting to help from friends. Looking back over some of his letters now, I notice that one of his comments seems particularly appropriate in light of the new 'Hyaku-nin Isshu' that we are making together: "I understand that although you basically intend to remain faithful to the original, I hope that we can see more and more of your personal ideas coming out in the work." It is comments such as this that have led me to feel more free to experiment with new colours and carving techniques, and I think as a result, my series is the better for it. Tanaka-san has not only helped support this work, he has influenced it. So now, I am very glad to be able to support his undertaking - the 'Shunsho/Bull/Tanaka Hyaku-nin Isshu'! A few months ago, I wrote about the ramen maker, Shimada-san, and worried about how many bowls of noodles he is serving every month just in support of my work. Now I have to wonder ... How many cabbages make up one 'Hyaku-nin Isshu' print? I'm afraid it must be an awfully big pile! Here's hoping that vegetarianism catches on in Inagi City! I have been getting occasional requests recently from collectors wanting information about the best way of taking care of their prints. I discussed some of these things a few years ago in a little pamphlet I enclosed with the earliest prints, but perhaps I should go over them more closely. After all, some of you now have quite a large pile of prints building up, and I would hate to think that they weren't being well taken care of! Unlike newsprint, the washi (Japanese paper) with which these prints are made does not contain many acids, and thus does not turn brown and crumble after just a few months, like your newspapers. Washi is one of the longest-lasting papers in the world, and does not really need much special care and attention to preserve it. There are a few things you can do however, to help your prints to survive for the longest possible time. If they are kept in a location where air cannot circulate, it is much more likely that they will become mouldy, or attacked by fungus. The packaging I provide with your prints (the blue case and torinoko folders) is designed to make a proper 'home' for them, but if they were to be left sealed inside it for years on end, they would not be 'happy'. Most libraries, or people dealing with old books or manuscripts, try and ensure that the materials under their care are exposed to the outside air at least once a year. The best time for this is of course the cold, dry autumn and winter months. It occasionally happens that one of my packages is damaged during shipping. The Japanese Post Office has always given me wonderful service, but my packages are a bit of an awkward shape, and sometimes arrive in damaged condition. If this happens to you (or has happened in the past), please do not hesitate to contact me for a replacement, either for the torinoko folder, the blue case, or for the print itself. I consider it my responsibility to get the print to you in good condition. If anything is damaged during shipping, I will replace it. I am always prepared for this, and have an 'extra' stock of material here, set aside for this very purpose. Please do not hesitate to let me know about such occurrences. It is very interesting that non-Japanese make up only about 10% of my collectors at the moment, but account for more than half of all 'damage' claims. Do their packages get damaged more frequently? I don't think so. Simply, they are more willing to speak up and let me know what happened ... On the other hand, it is the Japanese who are much more willing to speak up about faults with the prints themselves, things like scratch marks in the washi, or a blotch of sumi somewhere. I am of course happy (is that the right word?) to hear all such comments, as it is only thus that I can find out when things are going wrong ... So speak up! There was no mistaking it. He must have been one of the cooks - the white uniform, apron and headgear gave that away. But what on earth was he doing up there on the roof of the restaurant? It wasn't very steep, and he didn't seem to be in much danger. He was simply walking back and forth among the tree branches overhanging the building, carrying a small, flat basket. I wasn't able to watch long enough to figure out what he was doing, as my companions were too eager to get inside, and see if we could get seats. It was 'high season', this was a very popular restaurant, and it was obviously going to be very crowded. A small group of former English students of mine had suggested we do a bit of 'maple viewing', over on the Tama River in the Okutama area. I've been up there walking any number of times, but had never managed to make it during the season for seeing the fall foliage. Part of this had been my desire to avoid the crowds at that season, but the general 'busy-ness' of autumn had really been the main reason. Over the years though, I'd heard so much about the fabulous scenery up there, that when the suggestion was made for this trip, I didn't hesitate to accept. Things hadn't gone according to plan. One of the members had cancelled, another was late, and we then found out at the station that the trains were all off schedule, due to some kind of problem down the line somewhere. We were thus arriving at the restaurant nearly an hour behind our planned time, and didn't really expect to find a place. But there must have been some cancellations (perhaps because of the train problem), because to our surprise we were not only given seats, but given the best seats in the house - a corner table overlooking the river. Huge wide windows, with the warm sun streaming across the table. And outside, spreading all the way up the mountainside opposite, were the colours we had come to see. My companions were duly appreciative. "Wonderful!" "We're here just at the right time ..." "The colours are so beautiful this year! ", etc. etc. And it was a very pleasant scene - the sunlight reflecting off the water surface upstream providing a sparkling highlight to the green, yellow and brown panorama. They turned to me, "You don't have anything like this in your country, do you?" "We...ll, no. Not exactly ..." I tried to keep my voice neutral. But these women know me well, and the hesitation gave me away. "What's wrong? Don't you think our Japanese 'momiji' are beautiful?" Now I was in the soup. They were very proud of their beautiful scenery, and happy to be showing it to a foreigner. I shouldn't criticize it ... But what to say about the autumn colours in Canada? What to say about those Quebec mountainsides clothed in fire ... the absolutely brilliant reds, oranges and yellows? What to say about driving down a rural highway surrounded by displays of vivid colour that completely defy description? What to say about the crispness of the air, the unbelievable depth of the blueness of the sky ...? How to tell them about these things without seeming to criticize their autumn scenery? As I said though, we know each other well, so I told them of these things, albeit a little apprehensively. The rest of our meal became a kind of game; what was the 'significance' of each serving? Many were fairly straightforward - being simply seasonal vegetables. Some were more complicated - the name of the dish had a poetic allusion to the season. And a few of them defeated us (I should say - defeated them) completely. But at one point during the meal, a light went on over my head. Placed ever-so-carefully next to the food on one of the plates was ... a curled-up orange-brown maple leaf. Of course! This was what the cook had been doing up on the roof ... collecting ingredients for our lunch from the overhanging tree branches! This time my companions were not so polite. Laughing, they started to ask me, "In your country ..." I couldn't even let them finish the question. The idea of a restaurant cook prowling across the roof picking brown leaves to decorate the lunch ... No, I had to admit that I didn't think this would happen in Canada. As I suppose you have noticed by now, 'Hyaku-nin Issho' has had a facelift. Starting with this issue, I am no longer spreading large pieces of cardboard all over the floor, and scattering various little pieces of paper around on them, trying to figure out which story should go where. I prepared this one entirely on the screen of my new Macintosh computer, and what a treat it was to do it this way! 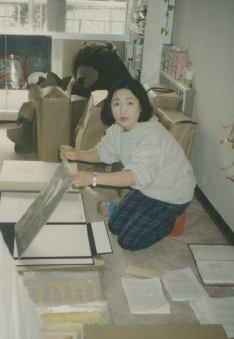 Although I was heavily involved with computers back in Canada, I had ignored them since coming to Japan and taking up this old-fashioned printmaking work. But a few months ago, I purchased this computer for use with a new hobby I've started (tell you later ... maybe! ), and after a bit of experimentation, found that it was easily capable of also handling this little publishing job. No more scissors and paste! No more counting lines and calculating column inches! Just click and click ... trying out various layouts until everything falls into place. It's not even work any more, but more like playing a computer game! There is however, one problem created by this 'new look'. Things are now somewhat out of balance. A friend who saw my test layouts for this issue commented that, "Gee, it sure looks professional. It's too bad the contents ..."